The store’s dedicated prepared food staff is trying to capture the “grease truck feel” which is an aesthetic I totally get, but it’s still disappointing that this truck isn’t actually mobile. Even if it had an engine, it wouldn’t be going anywhere as it currently sits on top of the store in their rooftop dining area. 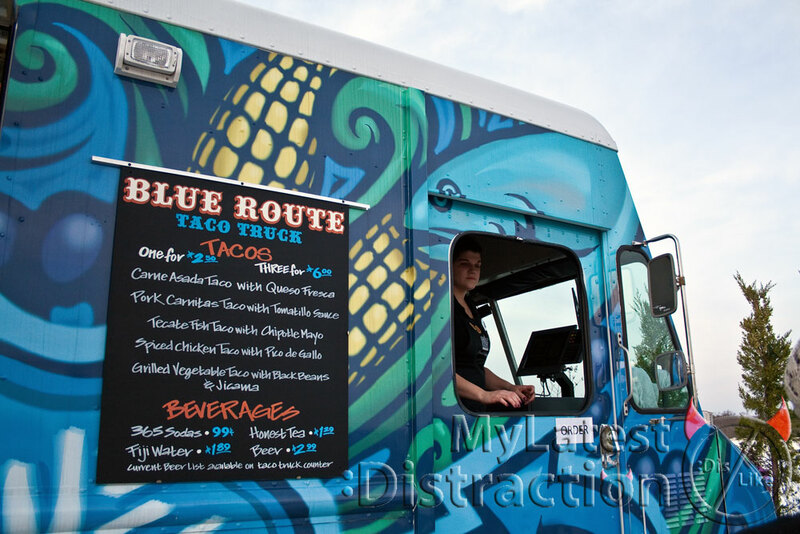 While not driving the food around is cheating a bit, everything inside is prepared as though it were an authentic food truck, just like the ones you’d find in big cities or on college campuses. Staying in a single location allows the truck to rely on the support of the huge prepared foods section downstairs. A plus for diners as this keeps the ingredients fresh and in good supply each day, but it loses an element of food truck business that has always astounded me: what to bring, how much to bring, and how to keep it all edible. Please note that many trucks have failed on that last part, and I’m beginning to fear that criticizing this truck for not driving around town is making a case in favor of the potential to cause a stomach ache. Suffice it to say in that regard, this is not truly a truck, but it still seems like an opportunity lost in not having this out on the streets. The Taco Truck is designed to be quick, fun and relatively inexpensive, and the crew at Whole Foods definitely did their homework. They have a great looking truck (certainly better looking than the Entourage taco truck I’ve seen rolling around), and it’s one more piece in a great set of offerings from the Plymouth Meeting store. The beta testing they’re doing before their official grand opening this Friday, April 15th, is paying off. I highly recommend it for the tacos, but I’m still on the fence about calling it a food truck even if it does capture the food truck spirit.